America in Jeopardy? The Answer is, “4 DEAD Americans Heroes.” What is the Question? I wanted to try to put the question, “What is Benghazi?” out to people that get to go home every night. They get to celebrate July 4th, Independence Day, tomorrow. They turn on the TV. They watch NBC, ABC, CBS, CNN News. Then they turn on Jeopardy. They think they have all the answers. They never hear about Benghazi, or the IRS scandals. So I decided to pose a question, as if it were asked on Jeopardy. 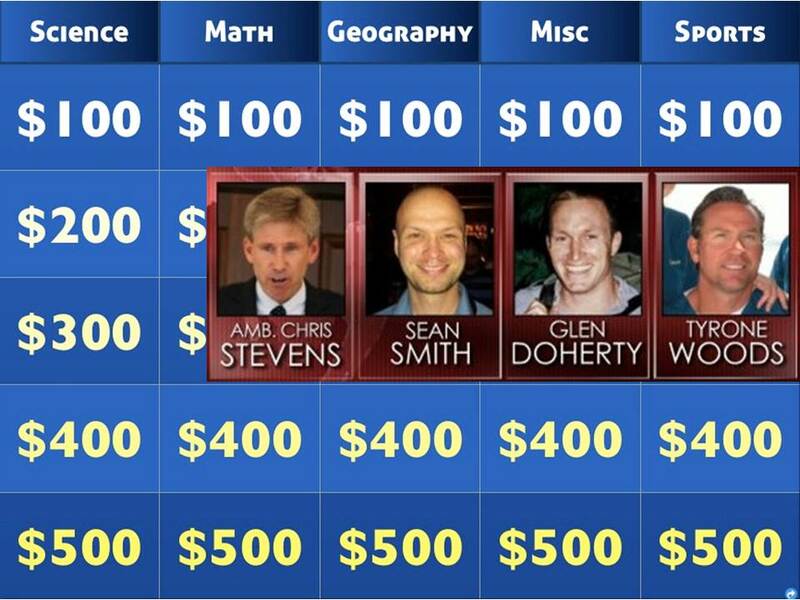 On Jeopardy, the answer is, “4 DEAD Americans heroes.” The question would be, “What is Benghazi? If this were a question posed on Jeopardy…maybe more Americans would stop ignoring and want to learn the answer. This brings me to the next Jeopardy question, “What is the IRS scandal?” The answer is, “A White House Cover up.” The White House was targeting conservative groups (Tea Party) before the 2012 elections to keep them from getting out the conservative vote.” Read – Strassel:The IRS Scandal Started at the Top. There is also an Obama campaign website targeting of Romney campaign donors, like Frank VanderSloot. While some people may think VanderSloot is getting what he deserves, there’s a real concern Obama can publicly target someone and a few days later Vandersloot is targeted by the IRS and the Labor Department with audits. How can we, as Americans, allow the most powerful agency in government, persecute innocent Americans regardless of their political affiliation? Instead of calling each other Libtards and Teabaggers, or worse, isn’t it time to realize our great country is in jeopardy? As for Benghazi, did I mention it has been almost 10 months, 296 days and counting, we still don’t know who is responsible for Benghazi and we have held NO ONE accountable for 4 DEAD Americans? They and their families aren’t celebrating the 4th of July with brats and beer like you and I, because they STILL don’t have answers!!! The White House has become The Best Little Whorehouse in Texas and Obama is Charles Durning in the Sidestep, a must see! Shame on NBC, CBS, ABC, CNN and all the the MSM outlets who refuse to admit the POTUS is your demagogue. Your MSM creation. I can’t celebrate Independence Day, the birth of our nation, when the Chicago Mafia has riddled, and will continue to riddle our Constitutional rights. 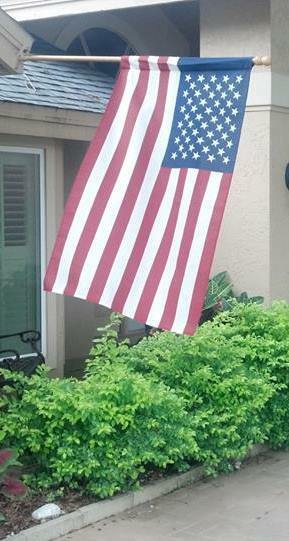 I’m hanging my flag at half mast on the 4th of July to honor of those who died in Benghazi and all American’s who have defended America and who have paid the ultimate price. As for the IRS scandal, there may as well be a guy who goes by the name of “Ben” Ghazi in charge of the FBI investigation into the IRS targeting of Tea Party groups, because the FBI still doesn’t know who’s in charge of the investigation and they don’t know who is responsible. Make sense? God love America! Happy 4th of July! 3 Responses to America in Jeopardy? The Answer is, “4 DEAD Americans Heroes.” What is the Question? What is America? A nation that will somehow survive despite paranoid conspiracy ideologues like yourself. Truly, this is a great nation. I can agree with you on your last point.